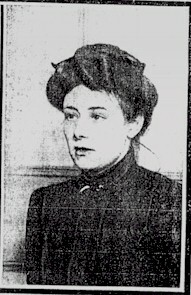 The 'Outrage' occurred in Tottenham on 23rd January 1909 and involved 2 Bolsheviks of Russian origin who had attempted an armed robbery of Schnurmann's Rubber Company in Chestnut Road Tottenham. Not a very smart move you might think since it was situated in the shadow of Tottenham Police Station. In their attempts to get away the two robbers, Paul Hefeld and Jacob Lapidus, started a chase and shooting spree that resulted in two deaths -PC William Tyler and a 10 year old boy named Ralph Joscelyne. The chase started in Chestnut Road and involved a variety of commandeered transport - Cars, Horse & cart and even a Tram. 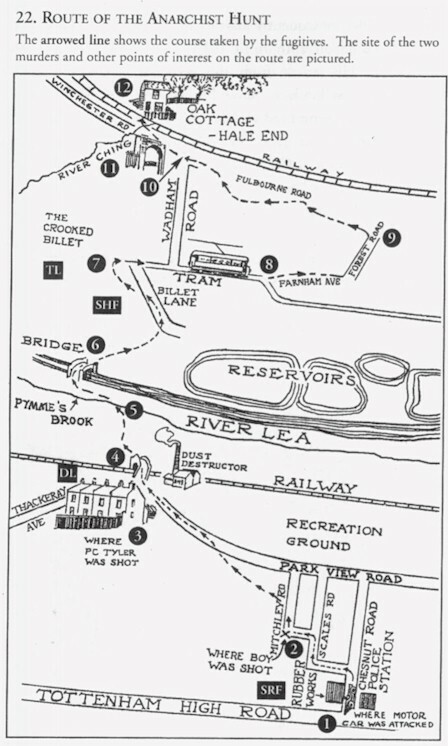 The chase continued through Tottenham Marshes across the River Lea then through the Reservoirs to Walthamstow. The chase continued on to Chingford where Jacob Lapidus shot himself through the head rather than be captured. Paul Hefeld finally took refuge in 'Oak Cottage' at Hale End Chingford when, following a shoot out with the Police, he was overpowered and captured. However he had sustained head injuries and died several days later in the Prince of Wales Hospital in Tottenham. 12. Oak Cottage - Lapidus dies. 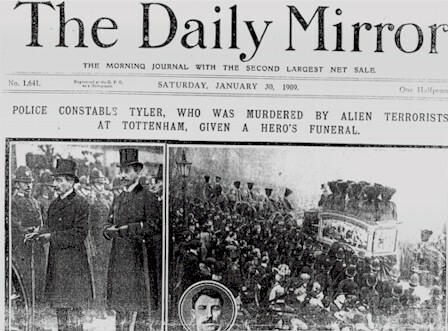 At the funeral of P.C Tyler no fewer than 3000 policeman were in the procession and there were 500,000 people on the two and half mile route between P.C Tyler's home in Arnold Road Tottenham and Abney Park Cemetery. The other victim Ralph Joscelyne was buried at the same time in a grave only yards from that of P.C Tyler. Never before had there been such a widespread demonstration of deep public sorrow at a police funeral. The blinds of all the houses on route had been closely drawn and shops were closed for the day with black shutters put up as a sign of mourning. Flags were lowered to half mast and mourning cards were being sold to members of the public. In addition to the two deaths, there was a large number of injuries to both the police and civilians. At the time of the 'Outrage' there was not the prohibition of today on private firearm possession. Some of the participants in the chase carried guns and had probably served in the Army, both here and overseas, keeping their weapons as souvenirs.The official reports lists 7 wounded Police Officers and 17 wounded civilians. George was later to live at Number 11 Summerhill Road, Tottenham where he died in 1948. See the feature on George in the 'Residents' section' which closely mirrors the above story. At the funeral service for her husband it was reported that 'Mrs Tyler, the widow, gave way to uncontrolled emotion. She wept bitterly and her sobs were heard at intervals throughout the reading of the burial service.'. After the funeral a fund was opened to collect money for Mrs Tyler. At the request of the Prime Minister, Mr Gladstone arranged for a payment of £100 to Mrs Tyler from the Royal Bounty Fund. In addition Mr Gladstone personally donated £10 to the collection. The King also expressed his sympathy in the following words " The Commissioner is commanded to convey to the police officers engaged in the tragedy at Tottenham the King's high appreciation of their gallant conduct. His Majesty also directs that the expression of his sincere sympathy may be communicated to the widow and family of Police Constable Tyler, killed while courageously doing his duty"
Note: For anyone requiring further information on the 'Tottenham Outrage' we would recommend 'Outrage - An Edwardian Tragedy' by Janet Harris published by Wilson Harris Publications - 2000 ISBN 0-9539641-0-8. It provides a wonderful and most interesting account of the entire incident from which we have borrowed much of our information. The book is also obtainable from Bruce Castle Museum in Tottenham. There are also a couple of other interesting websites that report on the 'Tottenham Outrage'. You can find the appropriate LINKS to these websites in our links section or from the main MENU.